More than a week of Turkish-backed air and artillery strikes and ground incursions into the Kurdish controlled Syrian region of Afrin have led to multiple credible reports of civilian harm. Affected areas include not just the Afrin enclave but also civilian towns within Turkey – and Turkish-occupied towns in Syria – which have seen retaliatory attacks from Kurdish forces. A new rolling assessment published by Airwars has so far tracked 24 claimed civilian casualty events within Afrin blamed on Turkey – and a further nine events attributed to Kurdish forces. From the start of operations on January 20th to January 28th, at least 41 to 55 civilian deaths have been assessed by Airwars as likely caused by Turkish-backed forces, along with an estimated 10 to 15 civilian fatalities tied to Kurdish counterfire. That civilian toll could increase dramatically if the fighting moves into more heavily populated areas where tens of thousands of civilians – many displaced from elsewhere – have taken shelter in Afrin and other Kurdish-held areas of northern Syria. The Afrin district of Aleppo governorate is cut off from the bulk of the remaining Kurdish-controlled areas in Syria (known as Rojava by Syrian Kurds) by Turkish-backed opposition forces to the east. To the north and west lie Turkish border areas from which Turkish-backed forces have punched through into Afrin district in several areas. Activists and aid workers on the ground tell Airwars that most displacement from the recent fighting has so far been confined to the Afrin region, as civilians move from targeted villages to other areas, including the city of Afrin itself. “The town itself has become a refuge for civilians from neighbouring border villages who fled their homes due to the Turkish offensive,” wrote the Kurdish Red Crescent in a January 26th Facebook post. Ground operations have heavily utilized Turkish-backed Free Syrian Army units. Airstrikes have been uneven, and limited compared to artillery fire, said Steven Cook, a senior fellow at the Council on Foreign Relations. The Turks are in some respects mimicking the recent American model in Syria – utilizing proxy ground forces, and backing them with heavier weapons from a distance. The US-led Coalition has employed a similar strategy to back the proxy Syrian Democratic Forces (SDF) in campaigns to take Syrian cities including Manbij and Raqqa. The SDF, however, is heavily dominated by member of a Kurdish separatist faction called the YPG. Justifying its attack on Afrin, Turkey in turn cites YPG ties to the Kurdistan Worker’s Party (PKK), which has waged a three decade insurgency inside Turkey, and is listed as a terrorist entity by both Ankara and Washington. While the YPG is Ankara’s target, it remains unclear just how far Operation Olive Branch, as it’s been dubbed, will go. Turkish Prime Minister Binali Yildirim said the first move in a four-part operation will be to secure a 30-kilometer “safe zone” along Turkey’s border, while President Recep Tayyip Erdogan has threatened to move on Manbij, which is located to the east of where Turkish-backed opposition forces have operated along the border since 2016. The US has at least 2,000 troops still in Syria, including a semi-permanent presence in the vicinity of Manbij. A move on that larger area by Turkey could prove explosive, pushing Washington to finally choose between loyalties to dueling Kurdish and Turkish allies. Turkey is a part both of NATO and a supporting cast member of the anti-ISIS Coalition. That US-led alliance in turn has relied heavily on Turkish bases to fly missions over Iraq and Syria – including those in direct support of the SDF. US officials have warned Turkey against incurring a heavy toll in Afrin. On January 24th, the White House said President Trump had urged Erdogan on a phone call that day to “deescalate, limit its military actions, and avoid civilian casualties and increases to displaced person.” The US has, however, stopped short of calling for an immediate cessation of hostilities. “The violence in Afrin disrupts what was a relatively stable area of Syria. It distracts from international efforts to ensure the defeat of ISIS, and this could be exploited by ISIS and al-Qaida,” US Defense Secretary Mattis said during a recent trip to Indonesia. Even as regional and international powers have grappled with the implications of the Afrin assault, the civilian toll has climbed. What appears to have been the deadliest incident since the incursion began took place on January 21st, when at least 10 civilians – mostly children – were credibly reported killed on a poultry farm in A’nabka by Turkish fire. 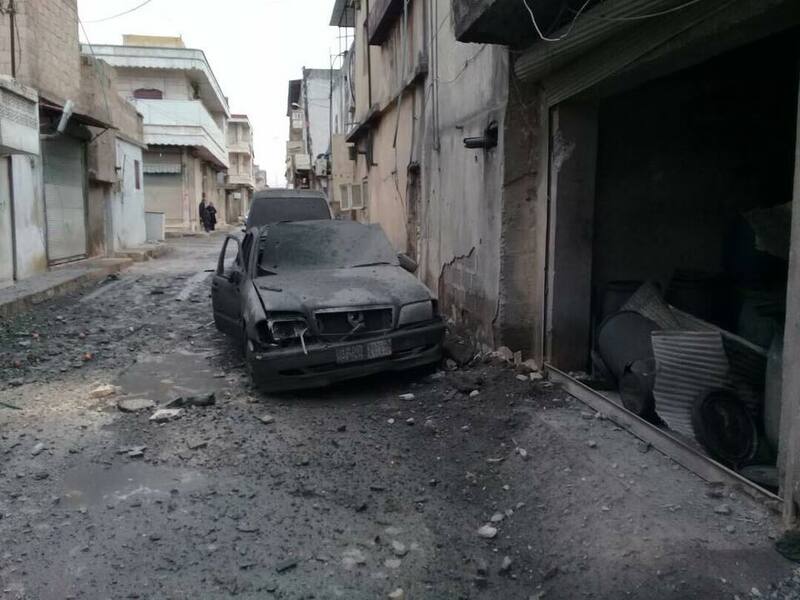 The local outlet Afrin Now initially named seven victims – 6 children and an adult woman – and later provided Airwars with the names of three additional victims, who it said belonged to a displaced family. On January 23rd, local outlets reported that between four and six more civilians were killed and and 16 wounded in an alleged Turkish attack on Jindires. Photographs posted on social media showed destruction in what appeared to be residential areas of the town. Additional graphic photographs uploaded to the website of the Manbij Military Council showed bodies being loaded into the back of a pickup truck. On January 26th, seven more civilians – reportedly belonging to a family displaced from Idlib – were alleged killed by Turkish strikes on Ma’abatli village. The outlet Free Afrin identified five victims, including a 14 year old child. “There are more than 100 displaced families from the villages of Afrin who moved to the center of the city of Afrin and reside in schools and cellars, and many [more] displaced families reside in the center of the city of Afrin in the homes of their relatives,” said Ali. Activists and monitors say casualties from Turkish strikes are so far largely being limited to more rural areas outside of Afrin city. Monitoring also suggest this is the case: only one civilian casualty incident recorded by Airwars researchers – a January 20th airstrike – was reportedly inside the city itself. #Turkish shelling today on the village of Blilko in the countryside of #Afrin . “The bombing so far has been in villages and towns around Afrin, but there have been few bombs in Afrin city,” Dr. Noori Sheikh Qanbar, head of the Kurdish Red Crescent, told Airwars. He said that the bombing in Jindires on January 23rd – southwest of Afrin city – had lasted for 24 hours, and claimed the lives of five people while leaving 27 wounded. 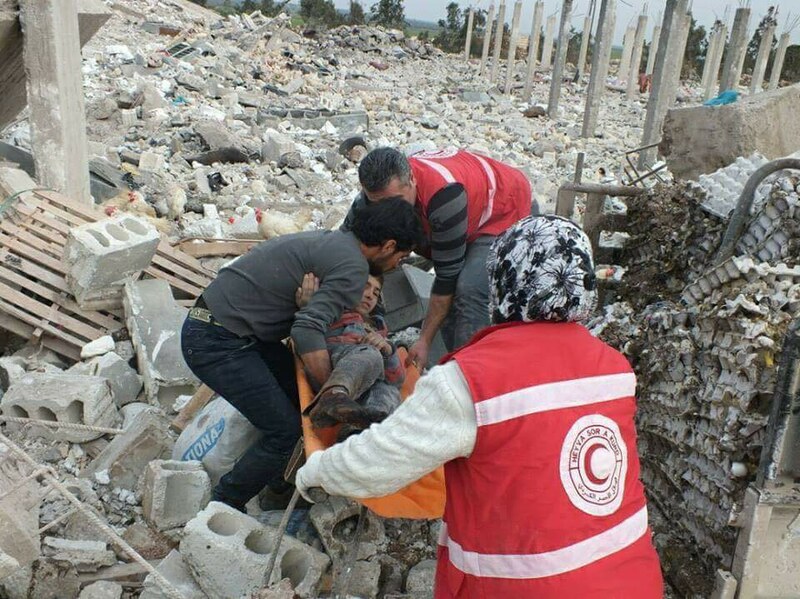 Qanbar said that to January 26th, the Kurdish Red Crescent had so far documented 162 wounded civilians. Kurdish attacks have also reportedly claimed lives, both in Turkey and in Syria. On the night of January 19th, Airwars monitored reports that at least one civilian was killed in Al Bab by Kurdish shelling. The following day another civilian was killed by shelling in Kilis, across the border in Turkey. On January 22nd, Airwars monitored three separate incidents in the Turkish town of Qeirekhan. In one case, Shahin Elitash, an electric company employee, was killed while repairing power lines. On January 24th, reports from FSA-held areas in Aleppo governorate indicated that several civilians were injured in a Kurdish strike that allegedly claimed the life of a Turkish-backed opposition fighter. Smart News agency said the rocket attack took place in Abla, south of al Bab. That same day, at least two additional civilians were killed and more than a dozen reportedly injured when rocket attacks hit a mosque and homes in Kilis. Information about operations and civilian casualties is, however, often widely contradictory. Falsely attributed photos and videos of conflict victims have made monitoring more difficult. “There are many inflated news reports published by both parties [pro-Kurdish and pro-Turkish media],’ said Ali of Afrin Now. The weak quality of some sourcing inside Kurdish-controlled Afrin – and in some cases, misleading or exaggerated reports – has made tracking civilian casualties more difficult. Social media accounts have for example circulated photographs of victims which Airwars researchers were able to tie to past events. Both sides in the Afrin battle are well armed and equipped, and are using battle hardened troops. However the use of heavy Turkish air and artillery power places the Kurds at a disadvantage. 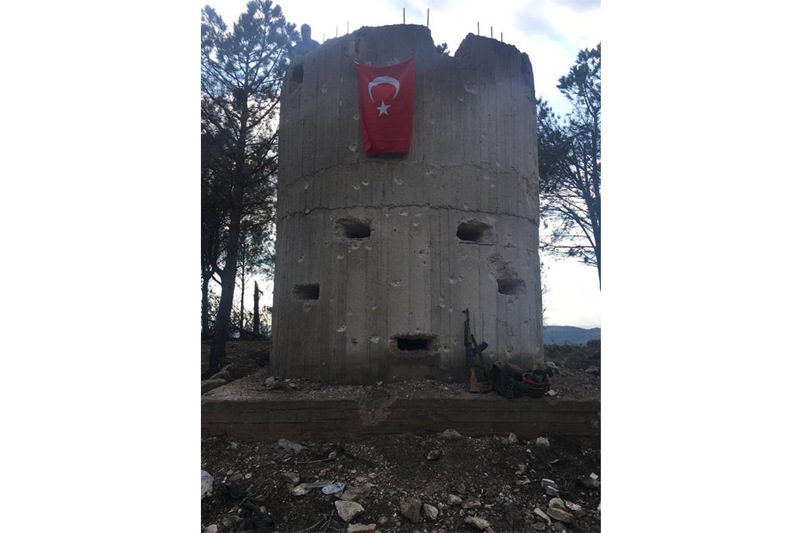 On the night of the 25th-26th, Turkey said that 48 targets were “destroyed” in attacks that involved “27 warplanes.” Reports on the ground however suggest that strikes have been more limited at night, and that artillery has often featured more heavily than aircraft. After a week of fighting, Turkey reported that three of its own soldiers had been killed along with 13 FSA fighters. It also claimed that more than 440 Kurdish forces had been ‘liquidated’ – numbers that are impossible to confirm. Meanwhile, Kurdish sources reported that one tenth that number of YPG fighters – 43 so far – had been killed, while claiming that more than 300 Turkish soldiers had been slain.